Using the XMM-Newton X-ray space telescope, astronomers have detected a globular star cluster that lies above the plane of an edge-on spiral galaxy and contains an X-ray source which they believe to be an intermediate-sized black hole (see small circle in above image). They believe it must have come from a dwarf galaxy that has somehow had all of it’s stars stripped away in the process of being accreted by the spiral galaxy. They infer from cluster’s colors that a population of hot blue stars must encircle the X-ray source along with a population of cooler redder stars. Is this not an example of a massive core star being ejected from the parent galaxy, which is growing a surrounding cluster of stars as it begins the process of growing into a daughter satellite galaxy? The presence of the ‘young’ hot stars is consistent with recent observations of ‘blue stragglers’ within ancient star clusters. And could not the redder colors observed be due in part to the gravitational influence of the 20,000 solar mass core star? Response to the questions of gmagee: The conclusion that this source originated from an incoming dwarf galaxy that has had its stars tidally stripped away is largely incorrect for no stream of stripped away stars is evident in this photo. As gmagee suggests, this source most likely originated from the core of this galaxy ( ESO 243-49 ) through a matter ejection event. Such matter creation and ejection is predicted by subquantum kinetics, and the existence of the phenomenon was earlier proposed by astronomers such as Ambartsumian and Arp to explain observations of active galactic nuclei. So this star cluster may be regarded as a galactic core ejection that will one day grow into a dwarf elliptical daughter galaxy orbiting this spiral. Evidence that galactic cores eject globular star clusters has been discussed in a previous posting (http://starburstfound.org/sqkblog/?p=271). Also the conclusion that this 20,000 solar mass X-ray source is a black hole is incorrect. As discussed in a previous posting (http://starburstfound.org/sqkblog/?p=115), and in the book Subquantum Kinetics, black holes should be unable to form. Particle scattering experiments have shown that the electric field at the center of the nucleon is bell-shaped, not spiked to an infinite point value. And, due to electrogravitic coupling, we may assume that its gravity field is similarly bell-shaped. Hence gravitational singularities are unable to form if there were any collapse. Anyway the outpouring of genic energy from a massive star prevents any core collapse. So, this above-plane globular cluster X-ray emitting source is more likely a supermassive mother star of finite diameter, not a black hole singularity. It would have a very high mass density similar to that of a white dwarf. The redish color seen in the cluster is not due to gravitational redshifting, but most likely comes from low mass stars in the cluster whose color is typically red. Such stars continually form and grow in the cluster from gas that is being expelled by the mother star core. The blue color that is observed comes from more massive and hotter stars such as blue giants, blue supergiants, and Wolf-Rayet stars. Yes, such “blue stragglers” are seen in other globular clusters such as the nearby cluster NGC 6752 discussed in the link above. The presence of such blue stars is a mystery for many astronomers because standard theory places their age at only millions of years whereas the red star population is typically believed to have an age of 10 billion years or so as in the case of NGC 6752. So they wonder why young stars would form in an old cluster. There is no such problem in the cosmology of subquantum kinetics. SQK predicts that low mass reddish stars continually grow in size through matter creation and accretion and eventually transform into the more massive blue stars. So these blue stars are not young, but actually the oldest and most evolved in the cluster. Such mature bluish stars are also found to surround our own Galaxy’s core. A study notes that the population of younger globular clusters within the Milky Way tend to lie in a plane tilted somewhat with respect to the Galaxy’s polar axis. Furthermore, also contained in this plane tend to be most of the known satellite galaxies. A similar structure is noted for M31, the Andromeda galaxy. Rather than the conclusion that this must hint at a past galactic merger, should not this observation lend support for the SQK model’s notion that the young globulars are progenitors of the satellite galaxies; that the globulars have been ejected from the Milky Way core and eventually grow into the dwarf satellite galaxies? Can SQK shed any light on why there is a preferred plane in which these globulars and satellites are found? In response to your comment, yes, I agree that this recent discovery of there being a preferred plane for both Milky Way satellite galaxies and massive-star globular clusters does point to the subquantum kinetics continuous creation scenario. It indicates that both likely originated through explosive ejection from our galaxy’s core and did not accrete to this plane from outside our galaxy. Plane of halo globular star clusters and dwarf satellite galaxies. Courtesy of Jon Lomberg. Think about it for a minute. If these galaxies and globular clusters had entered our galaxy’s environs from outside as a result of gravitational attraction, they should have entered in random directions and hence should not be aligned in any kind of plane. To explain a planar alignment with the outside origin theory, astronomers are left to hypothesize the existence of a large concentration of dark matter being embedded in this plane as a ring of dark matter filaments to preferentially draw these masses into this planar alignment and maintain them there. In fact, this is just what Keller et al. suggest in their paper to explain this planar alignment phenomenon which they have discovered. But there is no independent evidence for such dark matter. In actual fact it is a fudge factor that astronomers arbitrarily introduce to explain the unexpected existence of the planar alignment they have found. A much simpler explanation, one that does not need any ad hoc dark matter assumption, is that these globular clusters and dwarf galaxies were ejected from the center of the Galaxy during periods when the core engages in Seyfert-like activity. The smoking gun is the discovery that hypervelocity stars and high velocity gas clouds are receding from the galactic center at high angles to the galactic plane. In fact, the plane of the high-mass globulars and dwarf galaxies is found to be oriented almost perpendicular to the galactic plane, being inclined just 8 ± 5 degrees from the Milky Way’s pole axis direction. Take as an example the hypervelocity star HE_0437-5439, which is found to be receding from the Galactic center at 700 km/s and currently is seen at galactic coordinate position (l = 263.0°, b = -40.9°). Its coordinate location happens to deviate by just 10° from this globular cluster plane. Is this just a coincidence? I think not. This leads us to believe that there is a preferred direction in which our galactic core ejects stars and globular clusters with enough force to take them to these high latitude positions. In the subquantum kinetics cosmology, dwarf spheroidal and dwarf elliptical galaxies evolve from massive globular clusters through continuous matter creation. So it is not surprising that dwarf galaxies are also be found to lie along this preferred plane. Either they evolved from the more massive globular clusters that were ejected along this plane, or they themselves were ejected full size from our galaxies core. The latter would imply that dwarf galaxies constitute the upper end of the mass range of core ejections. It should also be pointed out, that what conventional astronomy refers to as “young globular clusters”, are in fact clusters that contain large numbers of blue supergiant stars and which according to conventional theory are believed to have young ages due to the supposed rapidity with which they exhaust their supply of hydrogen and helium. However, the continuous creation cosmology predicted by SQK requires that blue supergiants are actually very old stars, stars that have continually grown through matter creation and evolved up the stellar main sequence mass range. Or, if these globulars were ejected from the galactic core, it is quite possible that they were massive stars even at the time of their ejection. The hypervelocity star data supports the subquantum kinetics stellar evolution scenario because the time taken for these stars to journey from the galactic core is much greater than the lifetime that conventional astronomy ascribes for stars of this age. So, according to conventional theory, they should have long ago exploded as supernova or evolved into a white dwarf, neutron star, or black hole. But this is not the case. Take for example, the hypervelocity B-type star HE 0437-5439. This star at its current velocity would have taken at least 86 million years to journey from the Galactic center to its current position. Yet, standard theory claims that it should have a lifetime of only 33 million years, thus leading to a paradox. Distant universe contributes more infared radiation to total background, supports tired-light models? This article implies that the distant universe contributes more infared radiation to the total cosmic background radiation than does the local universe. Is this not support for the SQK prediction of red-shifting over these intergalactic distances? Seems a bit contrived to have to explain it as changes in dust content within galaxies over time. In answer to the above posting by gmagee, I would say, no, this is not related to the subquantum kinetics redshift prediction. The cosmological redshift would affect infrared wavelengths by the same amount as visible wavelengths. So it should not be a factor. What this study reports is that infrared radiation was observed to compose about half of the background light at redshift z = 3, whereas today it is seen to compose about one third of the background light. So the ratio of infrared background light to total background light has decreased over the last 3 billion years which has led the researchers to conclude that galaxies were producing more infrared radiation 3 billion years ago through increased star formation. However, I believe that they are looking at the wrong side of the coin. The other way to look at this is that the visible background light has proportionately increased. At z = 3, visible radiation composed about half of the background light, whereas today it makes up around two-thirds of the background light, hence a 30% increase, or a 10% increase in visible light every billion years. This could instead be interpreted as evidence that the number of stars emitting visible light has increased, and be cited as evidence supporting the subquantum kinetics continuous creation scenario. Our galaxy is estimated to have a mass of ~1012 M◉ and its core Sgr A* is estimated to expel matter at the average rate of 10 M◉ per year (based on Jan Oort’s estimate of gas outflow from the galactic center). So over 1 billion years our galaxy’s stellar mass should increase by at least 1%. Consequently, star proliferation falls short by a factor of 10 to explain the visible light increase. There is also evidence that our core in the past has ejected stars and globular star clusters as well. But this probably does not increase this matter creation estimate appreciably. But there is another effect arising from the SQK continuous creation hypothesis that could explain this visible light increase. That is, existing stars will be growing in size through internal matter creation and since stellar luminosity varies as M4 for stars on the upper main sequence, this should result in a proportionately greater increase in visible light. Let us first consider a star like our Sun. In past writings I have estimated that the rate at which the Sun’s mass increases through internal matter creation should be no faster than about 2 X 10-12 M◉ per year. (1) Hence the Sun’s mass should increase no faster than about 0.2% per billion years. Since stars on the upper main sequence M-L relation increase in luminosity according to L ~ M4, this amounts to a luminosity increase of only 0.8% per billion years or about an order of magnitude too small. However, most of the visible light in a galaxy is produced by its more massive stars, the O and B giants and blue supergiants, which have masses M > 3 M◉. A type-B3 blue giant having a mass of 3 M◉ normally has a luminosity of ~ 100 L◉ and a mass loss rate of ~10-11 solar mass per year. Subquantum kinetics proposes that a main sequence star progressively increases its mass, which implies that its internal matter creation rate always exceeds its mass loss rate. So if this hypothetical B3 blue giant star were to increase its mass at the rate of 3 X 10-11 M◉ per year (1% increase of its mass per billion years), it would increase its luminosity at the rate of 4% per billion years which accounts for almost half of the observed rate of increase in visible light. A 4 M◉ star having a luminosity of ~300 L◉ and an estimated internal matter creation rate of 10-9 M◉ per year, would increase its mass at the rate of 25% per billion years and hence more than double its luminosity every billion years. This overshoots the observed increase. But, remember, their are many fewer 4 solar mass stars than 3 solar mass stars. So such stars would make a much smaller contribution to the total increase. Astronomers are confused that giant elliptical galaxies containing old stars have been found to have regions actively forming new stars in a continuous process. These galaxies were thought to be old ‘dead’ structures, containing little cold gas to condense into new stars. 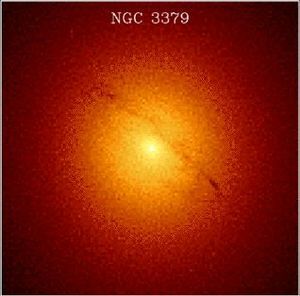 In response to the above posting of gmagee, astronomers were wrong to think that such elliptical galaxies would be dead; i.e., not forming stars. There is no such thing as a “dead galaxy” in subquantum kinetics. According to SQK, all galaxies are gradually growing in size and generating increasing amounts of matter. The research team, whose findings are reported in the above news article, studied stars in the elliptical galaxy M105, seen below. 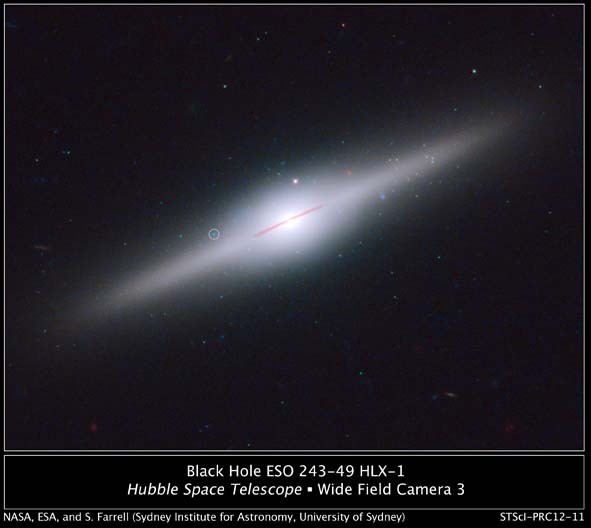 Conventional astronomy refers to elliptical galaxies as “dead galaxies” because they are not seen to contain massive blue stars which conventional astronomy considers to be indicative of recent star formation. However, Alyson Ford and Joel Bregman found that M105 does contain bluegiant stars, which in conventional astronomy are indicative of recent star formation; see circles in image blowup. They estimated that stars must be forming in this galaxy at the rate of 10-4 M◉ per year. According to SQK, this galaxy would have a far higher matter creation rate through parthenogenesis taking place within each star and within its massive mother star core. M105 is estimated to have a diameter of about 55,000 light years and a mass of about 100 billion solar masses. Hence it is about half the diameter of the Milky Way and about one tenth as massive. If its stars had a matter creation rate comparable to that of the Sun, its total stellar mass would be increasing at the rate of ~0.1 M◉ per year. Also M105 is known to have a core mass equaling around 50 million M◉, hence about 12 times more massive than the Milky Way’s core. If this were to have a matter creation rate per unit solar mass comparable with what I have estimated occurs in the core of the Milky Way, then the core of M105 would be generating matter at the rate of 100 M◉ per year, 1000 fold larger than the SQK estimate for matter creation within this galaxy’s stars, and a million fold larger than the star formation rate estimated by Ford and Bregman. This would imply that M105 is in fact growing at least 10 times faster than the Milky Way and that within the next 10 billion years it will have caught up with us, developing into a mature spiral galaxy. Evidence that the core of M105 has been active in the past is seen in this magnified view of the inner 15,000 light year region of M105 taken with the Hubble Space Telescope; see below. Central 15,000 light year portion of elliptical galaxy M105 viewed with HST. Courtesy of NASA/ESA. The dust ring seen here has a diameter of about 10,000 light years (3 kpc) and and may be compared to the 5 kpc diameter molecular cloud ring that encircles the core of our own Galaxy at a radial distance of about 2.5 kpc from the center. 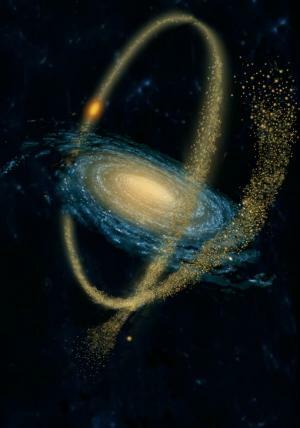 The Milky Ways molecular ring engages in radial motion suggestive of past core activity. Similarly, the presence of this ring in M105 suggests that there has been past explosive activity of its core as well, radial ejection of both gas and cosmic rays. 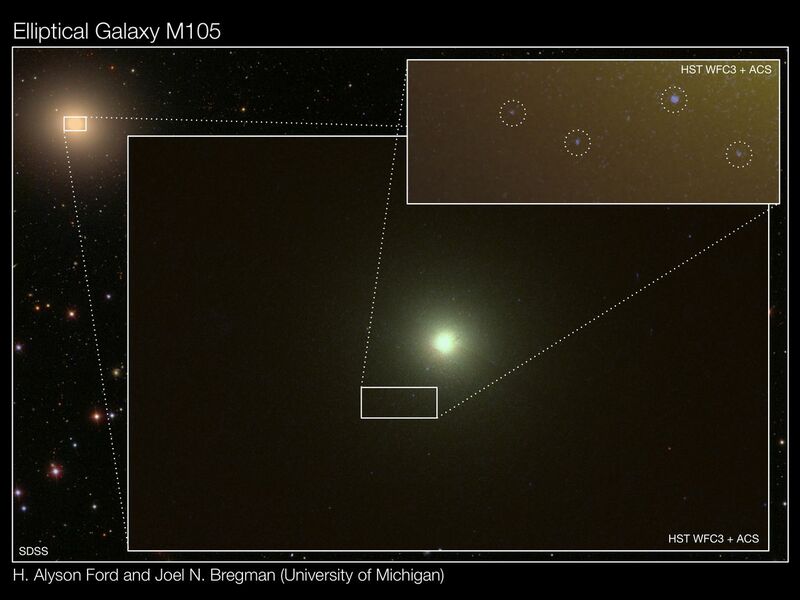 So in this sense M105 is by no means a dead galaxy. 1) Astronomers have recognized that galaxies grow from an initial core, or ‘seed’, much the way snowflakes grow. They conclude that the core seed attracts new stars via accretion from smaller galaxies during collisions. However, if this were the case, would we not see a more even distribution of galaxies with more ongoing galactic collisions in the universe? Of coarse, SQK explains this from a different perspective with massive ejections of new matter emerging from these cores to seed the galaxy’s growth from within. 2) Astronomers are now surprised that galaxy mergers are not necessary to trigger the active state of galactic cores. They conclude that another “secular” process must be responsible. They were also surprised that the early galaxies look so similar to nearby galaxies. Regarding the first posting, I agree that this theory that a galaxy grows from an initial seed core progressing from its center outward is in agreement with the continuous creation cosmology of subquantum kinetics. In SQK, this seed core is the galaxy’s supermassive mother star, the oldest “celestial mass” in the galaxy that has gradually grown in size due to continuous matter creation in its interior. Due to the dependence of the matter creation rate on gravity potential (the Model G bifurcation parameter), this growth rate proceeds most rapidly within supermassive cores. Again, in agreement with gmagee, SQK predicts that a galaxy grows from its core not by gravitationally drawing inward nearby galaxies, but by explosively expelling matter from it core. The finding by Strader et al. that globular clusters near the center of giant elliptical galaxy NGC 1407 have a higher metal content than more outlying globular clusters would corroborate this model. That is, this leads us to believe that the older globular clusters circulate in the central part of the galaxy near their supermassive mother star and that globular clusters created and ejected more recently from the mother star core are thrown further away from the core due to more violent expulsion by a core that has grown in size and energy output and can produce more violent ejections. It is worth noting that the Milky Way also is found to have a higher metal content towards its center. Globular clusters populating the spiral arm disc are found to have a higher metal content than globular clusters populating the Galaxy’s halo. Also the disc globular clusters are found to exhibit a radial gradient with older, metal-rich globular clusters residing closer to the center. This parallels the findings of NGC 1407 in that the younger globular clusters appear to be those forcefully ejected to greater distances from the core. 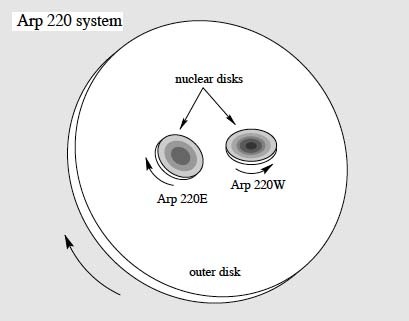 The second point that gmagee makes above concerns what induces a galaxy’s supermassive core to turn on and enter its active state. Astronomers had originally thought that galaxy collisions triggered this activity. If so, the discs of such galaxies should be severely disturbed. But observations now show that there is no evidence for this. Kocevski et al. studied galaxies as far away as 11 billion light years and found that galaxies with active cores looked no different than disc galaxies with nonactive cores. They conclude that whatever turns on a supermassive galactic core must occur internal to the galaxy. One suggestion is that a galactic core might randomly accrete a passing star. But, this too is problematic. For a single star is unable to provide enough matter to fuel the energy output of an active galactic nucleus. Moreover it is difficult to imagine how matter could become accreted by a galactic core since even in its off state a core radiates a substantial cosmic ray radiation blast. The physics of subquantum kinetics, however, provides an easy solution. No, external accretion events are necessary. A galactic core enters its on state because its continuous growth through internal matter creation has deepened its gravity well and pushed its genic energy production past the critical threshold. It then enters a runaway mode of excessive energy creation which lasts until it has ejected enough mass to once again return to its inactive state. Astronomers employ complex models of magnetic interaction between a star and its accretion disk during a star’s early formation in order to explain why stars rotate so slowly. Subquantum kinetics avoids this issue entirely since generally, most new matter is formed from within the core of the star, thereby not imparting any angular momentum to the star. Yes, gmagee makes a good point here. According to the continuous matter creation cosmology of subquantum kinetics, a main sequence star grows in size primarily through internal matter creation. Consequently, it is able to ascend the main sequence without increasing its rate of rotation. If they grew entirely by matter accretion, as conventional theory maintains, the large amount of acquired angular momentum that they acquired would cause them to spin so fast as to fly apart. Thus, to counter this tendency, standard theory is forced to postulate magnetic braking effects arising from the interaction of the star’s magnetic field with its surrounding dust disk. But a study of one open cluster has shown that 30% of the stars in the cluster have inner disc radii beyond the reach of their magnetic field, hence no means of braking their rotation. The stellar evolution theory of subquantum kinetics offers a much simpler explanation. This news item claims to overturn conventional galaxy formation models where spirals and ellipticals had previously been thought to form in different ways. It shows instead that elliptical galaxies actually resemble spiral galaxies with the dust lanes removed. This would also support the SQK model of galaxy evolution, which predicts that mature spirals grow into giant ellipticals. The study that gmagee refers to above finds that most elliptical galaxies have rotational properties similar to spiral galaxies. It, in effect, acknowledges what subquantum kinetics had previously been claiming for many years. Namely, SQK has proposed that dwarf ellipticals, grow into lenticular elipticals and then with further growth transform into spirals, this sequential evolution being due to matter being continuously created in their cores and subsequently ejected along their plane of rotation. This galaxy evolution scenario is consistent with the findings of this study. No galaxy mergers can be involved in such a morphological transformation. If mergers had been involved, the collisions would have turned the earlier galaxy into an irregular galaxy, thus breaking the sequential evolution of its morphology. So this close connection between ellipticals and spirals confirms that this does not happen. This leaves core matter creation and ejection as the only feasible alternative. The study also finds that giant ellipticals, which are characterized as being “slow rotators”, are a distinct class of elliptical galaxy. This conforms with the SQK galaxy evolution scenario which proposes that giant ellipticals are formed as a late stage of spiral galaxy evolution and do not evolve directly from the “fast-rotator” elliptical galaxy stage.